Enjoy one minute of endless match-3 fun from PopCap and EA – and play for free! 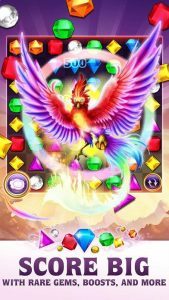 Detonate as many gems as you can in 60 action-packed seconds in the hit puzzle game played by over 25 million people worldwide. Match three or more and create cascades of awesome with Flame gems, Star gems, and Hypercubes. Use powerful Rare Gems and dominate the weekly leaderboards. Feeling lucky? Play the Daily Spin each day for your chance to win 1,000,000 free Coins!